The Twelve Caesars, written by Gaius Suetonius Tranquillus (c.AD 71 - c.AD 135), is a set of biographies of Julius Caesar and the first eleven emperors of the Roman Empire. Material for The Twelve Caesars was gathered from the imperial archives and surviving eyewitnesses of the time, as well as his own experiences of life at court. The work tells the tale of each Caesar's lives according to a set formula of descriptions; appearance, omens, family history, quotes and then a history, which are all given in a consistent order. The pack contains 12 Aurei from the first 12 emperors of the Roman Empire. The Emperors are Julius Caesar, Augustus, Tiberius, Caligula, Claudius, Nero, Galba, Otho, Vitellius, Vespasian, Titus and Domitian. 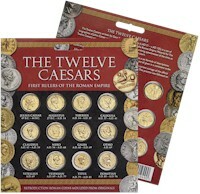 The spectacular Twelve Caesars coin pack contains 12 coins held in clear plastic blisters, and the coins obverse and reverse can be clearly seen. The full colour card show images of Roman coins on the front and back and has historical text on the reverse. Roman Column supplied on a pin with clasp. The information on the reverse of the card explains how coins were used to communicate, about Roman houses and about Minerva. Wallet type packaging with a reproduction Cnut Penny held in a blister on the front. On the inside and reverse there is information about The Vikings and the coin. Wallet type packaging with a reproduction Aureus held in a blister on the front. On the inside and reverse there is information about Hadrian's life.